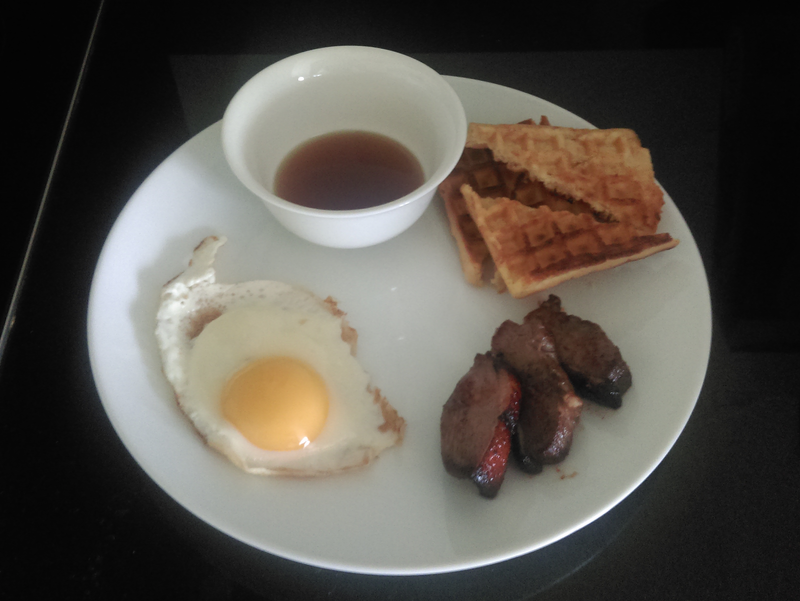 Duck has to be one of my favourite meats, why not have some for breakfast instead of dinner? Duck is easy enough to cook, just fry it! Fry it skin side down but be careful not to have the heat too high, and watch it carefully, as it can burn easily. 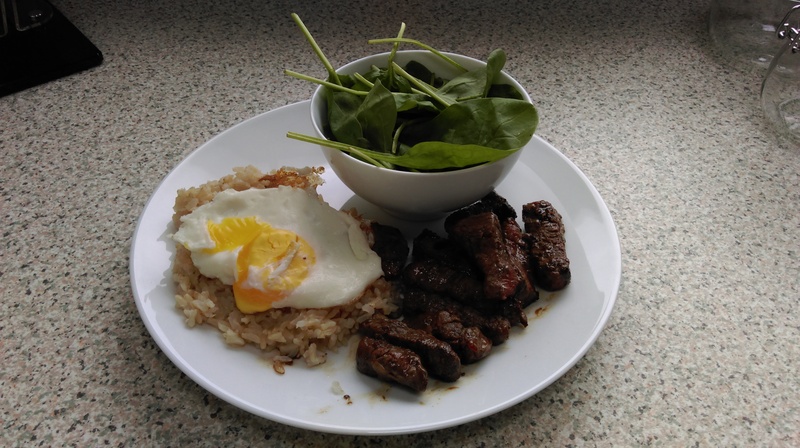 While duck has a reputation for being fatty (and I didn’t trim the fat off), its also high in iron and protein. After the duck has been fried and looks cooked (cut it in half to be sure, its okay to be a tad red/pink), pour over some syrup, this sounds indulgent, but syrup is high in zinc, which your body doesn’t produce by itself, and zinc helps boost the immune system. Then bake for 4 to 6 minutes after that at 180 degrees. Serve with a fried egg, a toasted waffle, and some extra syrup for the waffles, and what a great start to the day you’re having. Breakfast of champions. You can train and exercise all day and all night but if the food you eat isn’t right, isn’t healthy, then you’re not going to look as good or be as healthy as you want. I love educating myself about the human body, how we move, and different types of training techniques, but when it comes to food science, I’m in the remedial class. Trying to learn about calories, and fats, and all that stuff, its enough to put me to sleep. Because I have no will to learn about food, I instead follow a much more basic philosophy, I eat what I know to be good, and stay away from what I know to be bad. The food industry doesn’t always help in this regard. Edward Bernays, the nephew of Sigmund Freud, is perhaps the father of modern advertising, and modern advertising makes it hard for ordinary people to know what to eat. Bernays used psychoanalytical ideas for PR and advertising. Beforehand, goods were advertised based on utility, “this is what it does”, while todays advertising targets your emotions and aspirations, “want to be cool – buy this phone” – “want to be healthy and slim like the celebs you love – then eat this”. You’re being sold a narrative that more often than not, the stuff you buy can’t deliver on. Check out the ingredients list on the “healthy snack” below, its massive, and sugar is mentioned 4 times!! Contrast that to the ingredients list on the banana, there is none, its a banana. Stay away from food that is marketed and packaged as healthy, and eat what you already know to be good for you. Its unfortunate that our bodies have evolved to crave sugar for its positive effects in small quantities. For millions of years, our cravings and digestive systems were exquisitely balanced because sugar was rare. Modern technology has made sugar bountiful and we don’t seem to realise that our bodies are not adapted to large amounts of sugar and it’s making us sick. I don’t “diet”, partly because I don’t like the word, it invokes imagines of starving oneself. I eat lots, I enjoy my food, and I eat healthy. But we’re all only human. Its hard to resist the constant media bombardment of delicious sugary foods and our own evolutionary inbuilt cravings. I have one cheat day a week, and on cheat day that Coca-Cola tastes incredible!! My advice, have one cheat day a week, it doesn’t always have to be the same day each week, and stay away from foods with too big an ingredients list. This one is a nice healthy energy booster. 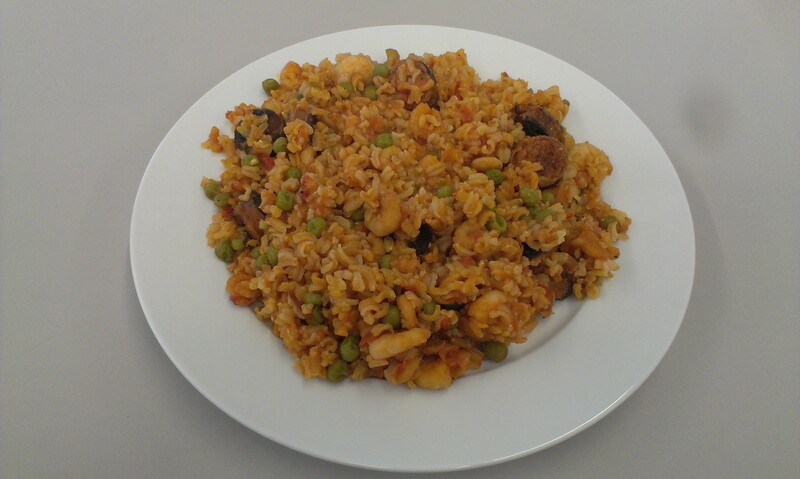 A simple list of ingredients; prawns, chorizo, brown rice, chopped tomatoes, chicken stock and some frozen peas. Using Brown rice instead of white rice packs this full of complex carbs, so eat this earlier in the day, and you’ll have plenty of energy to keep you going. The Chorizo adds a rich flavour (if you like Chorizo, which I do) and the prawns add muscle building and protecting protein. Make a large quantity of this in a big pot and it will do for your lunch for days!